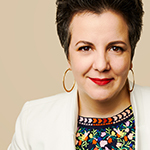 MARIA MANUELA GOYANES, the newly-selected Artistic Director of Woolly Mammoth Theater Company, is currently serving as the Director of Producing and Artistic Planning at The Public Theater. In her current position she oversees the day-to-day execution of a full slate of plays and musicals at the Public’s five-theater venue at Astor Place and the Delacorte Theater for Shakespeare in the Park. In addition, she spearheads the season planning process as well as the planning and integration of The Public’s many artistic programs, including the Under the Radar Festival, Public Works, and special offerings in Joe’s Pub, among others. For six years before she assumed her current position, she worked as an Associate Producer, managing some of The Public’s most celebrated productions, including Hamilton by Lin-Manuel Miranda, Josephine & I by Cush Jumbo, Straight White Men by Young Jean Lee, Barbecue by Robert O’Hara, and Here Lies Love by David Byrne and Fatboy Slim, among others, as well as The Public Works’ productions of The Tempest, The Winter’s Tale, The Odyssey, and Twelfth Night. Earlier in her career at The Public, where she started as a staff member in 2004, she produced The Public Lab productions of work by Roger Guenever Smith, Branden Jacobs-Jenkins, The Civilians, Naomi Wallace, Tracey Scott Wilson, and Adrienne Kennedy. She also worked closely with Suzan-Lori Parks and Bonnie Metzgar on the yearlong 365 Plays/365 Days Festival. In addition to her work for The Public, Maria holds a position on the adjunct faculty of Juilliard, where she co-teaches a producing course, and she curates the junior year curriculum of Playwrights Downtown, the Playwrights Horizons Theater School at NYU. She has guest lectured throughout her career at Bard College, Barnard College, Brown University, Columbia University, Juilliard, Marymount Manhattan College, the National Theater Institute at The Eugene O’Neill Theater Center, NYU, Pace University, UCSD, the University of Texas-Austin, and Yale University. Since 2015, Maria has also served as a member of the board of the National Alliance for Musical Theatre. From 2006 to 2008, she co-chaired the Soho Rep Writer/Director Lab with Jason Grote. From 2004 to 2012, Maria was the Executive Producer of 13P, an award-winning, innovative theater company that produced new plays by 13 emerging and mid-career writers: Anne Washburn, Winter Miller, Rob Handel, Gary Winter, Kate Ryan, Ann Marie Healy, Sheila Callaghan, Julia Jarcho, Lucy Thurber, Madeleine George, Young Jean Lee, Erin Courtney, and Sarah Ruhl. By the time the company completed its mission, 13P had won three Obie Awards for its productions, along with a Special Citation Obie Grant for the company as a whole, and published an anthology of the collective’s plays. Maria is a first-generation Latinx-American, born to parents who emigrated from the Dominican Republic and Spain. She was raised in Jamaica, Queens, and has a collection of hoop earrings to prove it. She earned her Bachelor of Arts in 2001 from Brown University, where she received a Susan Steinfeld Award. After graduation, she served as the Associate Producer at Trinity Repertory Company, establishing a family programming series and acting as a liaison to the Latinx community of Providence. Later, in 2007, she received the Josephine Abady Award from the League of Professional Theatre Women. We’re incredibly excited to introduce Woolly’s next Artistic Director, Maria Manuela Goyanes!